Remember all of those science-fiction movies and books from Jules Verne, like “Journey to the Center of the Earth”? Apparently not everything is made up. There might be a lot of unknown stuff down there… and if there is water… could there be life? Maybe not as we know it but in a completely different way? Well the possibilities are there. After decades of theorizing and discussing possibilities, scientists report to finally have discovered a large ocean of water inside the mantle of Earth, and they pint out that it is a large water “tank” that could fill the oceans on Earth three times. This incredible discovery suggests that the surface water of the planet came from within Earth, as part of a “complete water cycle on the planet” instead of the dominant theory proposed that water arrived to Earth by icy comets that passed by the planet millions of years ago. Scientists are learning a lot about the composition of our planet even today. And the more they manage to understand, the more accurately will predictions regarding climate change, weather and sea levels get since all of the mentioned above is closely related to the tectonic activity that vibrates incessantly beneath our feet. This study was performed by researchers and geophysical scientists in the United States and Canada who used data obtained from the USArray- which is a set of hundreds of seismometers located throughout the United States to constantly “listen” to the movements of the Earths mantle and core. Researchers believe that the water on Earth may have come from within the planet and was “pushed” to the surface thanks to geological activity. An article published in the journal “Nature” states that researchers have found a small diamond that points to the existence of a vast water reservoir beneath the mantle of the Earth, approximately 600 kilometers beneath our feet. According to the lead author of the study Graham Pearson, member of the University of Alberta, Canada, “This provides extremely strong confirmations that there are wet spots deep inside the Earth”. “The transition zone may contain as much water as all the oceans together,” Pearson said. “One reason why the Earth is a dynamic planet, is the presence of water inside. The water changes depending on the way the world works,” he added. After researchers have studied the movements in the mantle and the core of the Earth for years, and after completing countless complex calculations to double check their theories, researchers believe they have found a gigantic pool of water located in the transition zone between the layers of the upper and lower mantle – a region which sits somewhere between 400 and 660 km below the surface. This discovery opens up a door of other possibilities of what else is down there? 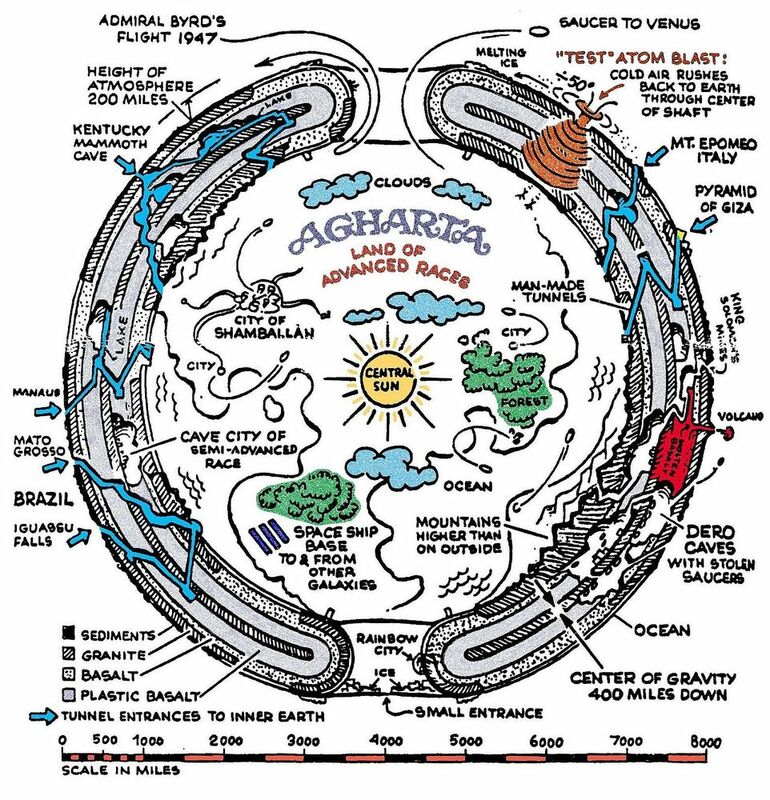 Are those theories that talk about the Earth being hollow true? Well, our planet might not be Hollow, but it sure isn’t rock solid, as scientists themselves have said that there are countless enigmas regarding what exactly is below the surface and very strange things happen 600 kilometers below the surface. This new theory suggests that the planet’s mantle is filled with a mineral called Ringwoodite, and this mineral is believed to contain water. 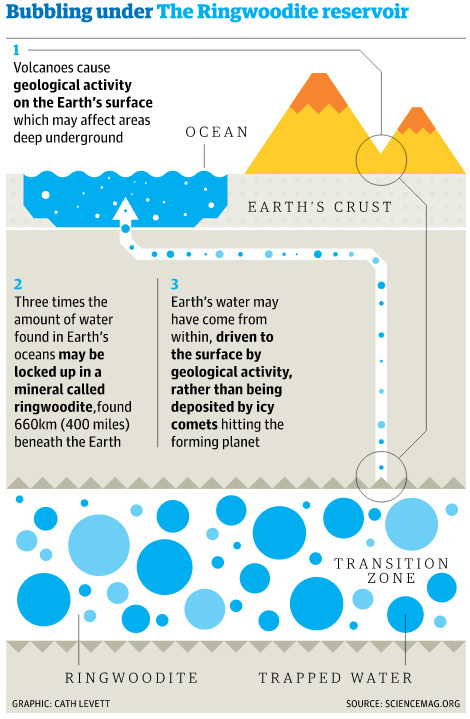 Measurements by the USArray indicate that the deeper the mineral Ringwoodite is pushed into the mantle, the increased pressure forces the water, a process known as “merging dehydration”. Is there another world beneath ours? Well, that depends on what you believe, but ancient mythology and history have often spoken about the underworld and that it can be accessed. The question here is … does this discovery change anything? Skeptics will remain closely minded and will hold on to their precious ideas and theories, but with each new research and study, we understand that we have very little knowledge about Earth, its oceans and that what is located below the surface.